We have heard of DWI (driving while intoxicated) but legislators are now trying to make DWT (driving while texting) an offence. This is of special interest to BlackBerry users who are being singled out by both legislatures and insurance companies as especially bad examples of the new and dangerous trend. To most people it would make sense. Trying to type on the small keypad of a phone or BlackBerry while operating a vehicle sounds stupid and dangerous, but with more and more people relying on their PDAs and smartphones, the incidents of collisions and deaths as a result of this are on the increase. A new survey by the Liberty Mutual Insurance company, 37 percent of American teens surveyed said they found text messaging to be extremely or very distracting while driving. Another study conducted by Nationwide Mutual Insurance found that 19 percent of all drivers text message behind the wheel and that percentage goes up to 37 percent for younger drivers. On a recent report on CBS television, a reporter showed how easy it is to become distracted while attempting to text on her BlackBerry. Luckily her resulting “accident” was in a simulator but, as was detailed in the report, there are plenty of examples of real tragedies. 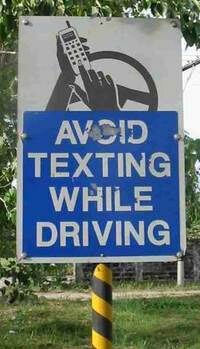 In Tennessee in 2005, a man died when he drove off the road and down and embankment while texting. The CBS report detailed an accident in Colorado where a teenager struck and killed a bicyclist while texting a friend. The teen served 10 days in jail. The US federal government has estimated that as many as 30 percent of all crashes in the United States involve driver distraction. According to the Wall Street Journal, 38 states are now in the process of passing laws banning the use of cell phones. Connecticut, New York, New Jersey and California already have laws in place. The District of Columbia does too and also fines motorists for any distractions including putting on makeup while driving or reading e-mails behind the wheel. In other states bills are pending. In both Arizona and Oregon, new laws would allow for heavy -- up to $720 -- for any driver caught texting while driving. The insurance industry is getting ahead of the curve on the issue and isn’t waiting for legislation. Allstate has released a series of TV commercials in which a businessman is shown holding a BlackBerry and while balancing the business section of a newspaper on the steering wheel while weaving through traffic. It warns of the dangers posed by too many distractions behind the wheel. Remarkably, lobbyists for the wireless industry are working hard to oppose any legislation that would limit cell phone and PDA use in cars, saying education is better than more restrictions. They also point to the issue of enforceability. If you were facing a $750 fine if you crashed your car while texting would you own up to that? Few would. Enforceability aside it seems that legislation will be here sooner rather than later so us CrackBerry users had better get used to it.